Howland’s speculation in land in the Annex area resulted in Howland Avenue being named for him. He also founded the village of Lambton Mills on the Humber River. Howland dictated his memoirs at the request of Sir Wilfrid Laurier. A friend of George Brown, Howland was a leader in the Reform Party of the 1850s and 1860s. He participated in the London Conference of 1866, which drafted the country’s constitution — the British North America Act — and gave the federated colonies a new name “The Dominion of Canada”. He was a cabinet minister in the first federal government of Canada and was later appointed Lieutenant Governor of Ontario. His two sons, William Holmes Howland and Oliver Aiken Howland, both served as mayors of Toronto — a record yet to be beaten! 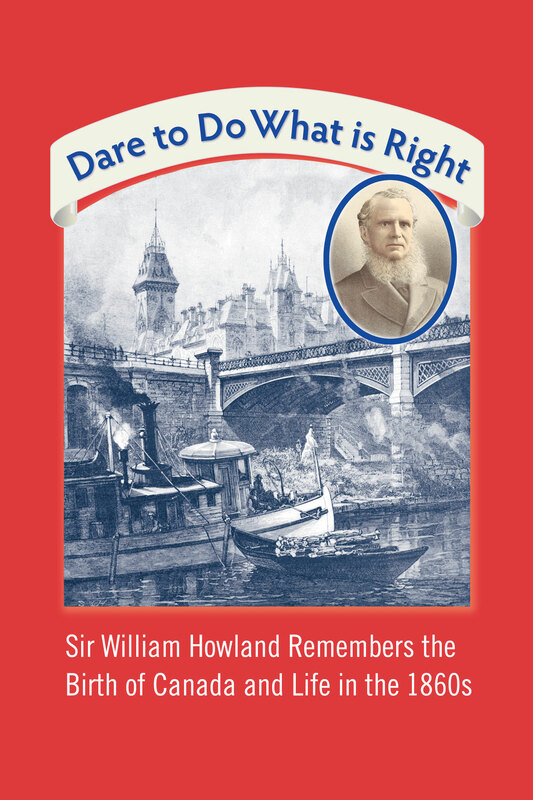 In 1906, Howland dictated his memoirs at the request of Sir Wilfrid Laurier, who was then prime minister of Canada. His lively memoir describes the negotiation of Confederation, as well as the plans of Toronto business people to trade with settlers and Metis in the West and attempts to renew a trade treaty with the United States. Some issues just don’t go away. The memoir includes vivid descriptions of people he knew, including William Lyon Mackenzie, John A. Macdonald, and George-Étienne Cartier. To celebrate the 150th anniversary of Confederation, two local heritage groups — the York Pioneer & Historical Society and Heritage York — collaborated to put in print his unpublished manuscript. 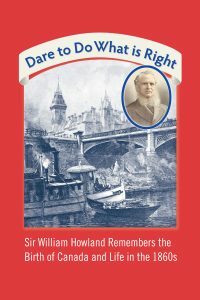 The memoir was given the title Dare to Do What is Right to recall Howland’s commitment to Confederation and as a reminder of how Canada continues to inspire the best in people. Copies are available at www.yorkpioneers.com and make a great souvenir of Canada’s 150th birthday. David Raymont is the president of the York Pioneers. He raised a dispute over a question of very little importance and left the cabinet table declaring his intention to resign — a proposal which caused me to feel great anxiety and concern. I followed him to his lodgings and at his bedside proceeded to urge upon him not to take the course which he proposed. I pointed out that if [I] went into opposition under his leadership and the majority of the Reform Party went with us…it would destroy the chances of carrying and completing [Confederation] for which the Government was specially formed and which was of such great importance to the interests of the country. In the morning Mr. Brown [resigned and] …I carried out my determination and met the members of the Reform Party at Guelph, where the whole matter relating to Mr. Brown’s action was discussed.